This house is for those who want the best vacation home that money can provide. 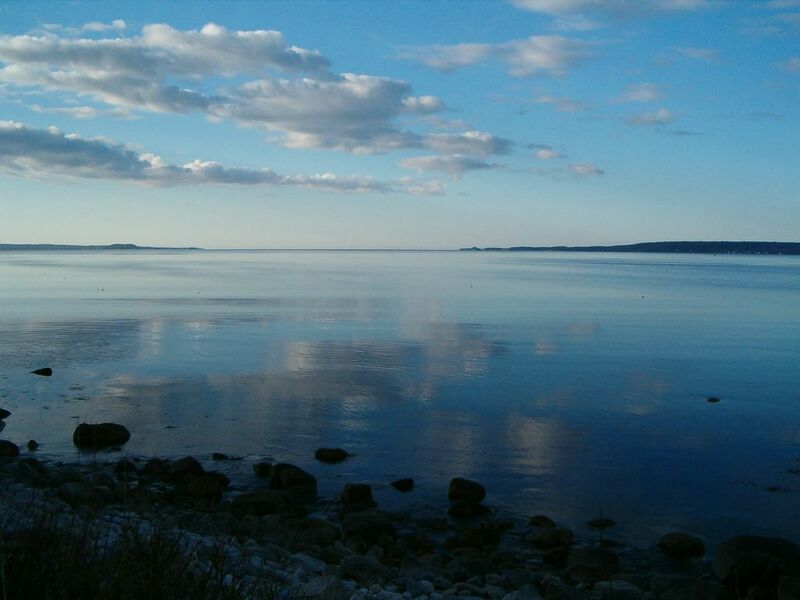 This beautiful, non-smoking home is centrally located in Hubbards, Nova Scotia -- on St. Margaret's Bay. It's an easy 30- to 45-minute ride from the ancient Halifax fortifications, Peggy's Cove preservation district, and the beautiful Mahone Bay area. St. Margaret's Bay is known throughout the world for its picturesque fishing boats, magnificent vistas, and quaint sandy beaches. Visit historic Lunenburg (a Unesco World Heritage Site) in under 45 minutes by car. Additional information regarding home: Watch your children play on the front lawn, with the ocean as a backdrop. The master bedroom has a picture window overlooking the blue expanse of the ocean. Three additional private bedrooms overlook the ocean and lawns of the home. Walk or drive to the nearby sand beaches along beautiful St. Margaret's Bay. Enjoy Nova Scotia's finest seafood restaurants in Hubbards each evening. The Shore Club, a local Nova Scotia tradition, offers lobster dinners and weekend activities -- just a short distance from the home. Sail at the nearby St. Margaret's Bay Yacht club. Or ride your bike and kayak around the nearby coves and fisherman's wharves. When you come home from your nightly activities, sit by our giant brick fireplace and watch the moon through the panoramic picture windows overlooking the magnificent, unobstructed, oceanfront vista. Amenities Information: The house is fully equipped with all amenities including a phone, TV/VCR, modern appliances (including a washer/dryer), comfortable furnishings, and lawn furniture. The home has a private, in-ground swimming pool and separate sauna. The house is furnished with 2 king size beds, a queen-size bed, a double-size bed, and two single beds. We welcome you to see the best of Nova Scotia. Location Information: Hubbards is a beautiful small seaside village located on St. Margaret's Bay in the center of Nova Scotia's famed Lighthouse Route, about 1/2 hour from Halifax, Nova Scotia. The town has a charming harbor used by small fishing and leisure boats in the summer and is a relaxed, Nova Scotia town. Numerous scenic drives can be taken along the ocean bordering St. Margaret's Bay, including a trip to the famous Peggy's Cove preservation district. Lunenberg, a Unesco world heritage site and frequent port of call for the HMS Bluenose (a Canadian tall ship), is only 45 minutes by car from Hubbards. Other charming seaside villages within a short drive include Chester (home of the Chester sailing race weeks), Mahone Bay (a very well preserved Colonial seaside village) and Halifax itself. Whale watching, fishing, beach combing and other seaside activities define summer along the Lighthouse Route, along with scenic drives and tours to Halifax and the surrounding communities. We are a family that lives in the United States during the winter and travels to Nova Scotia for our summer holiday. We like to go to the beach, swim in our pool, go sailing and spend time in Halifax when we travel to Nova Scotia. We love Nova Scotia and hope to share the beauty of the province with each of you. We live in the Boston area and started traveling to Nova Scotia in 1998. Prior to purchasing a home, we traveled to various parts of Nova Scotia for summer holidays. Nova Scotia has many beautiful areas, but when we decided to purchase a home we felt that we wanted to have a home near Halifax and the Lighthouse Route. This portion of Nova Scotia is popular with both Canadian and expatriate owners, due to the proximity to Halifax, easy drive to the airport, beautiful beaches and fantastic scenery. The area reminded us of the New England coastline without the commercialism and crowded roads and beaches. We spent a long time looking for a house to buy near Halifax, and eventually decided to purchase our home. On the day that we visited our house for the first time, the sun was shining brightly on the ocean in front of the house displaying a million beautiful ocean diamonds of light. The privacy of the house (at the end of a private drive) and the stunning view in front of the house were more than enough to make us want to buy the home. From the outside, the shingled house looked like it could easily have been located in Cape Cod or Nantucket, making us feel quite at home. Once inside the cottage, we were struck by the beauty of the ocean views from the living room, the luxury of the remodeled kitchen and the warmth of the home. We knew that this was the house that we wanted to own. We have been traveling to Nova Scotia for our summer vacation every year since 2001. We return to visit our wonderful Nova Scotia friends, spend time on the beach and simply spend time together with our family. The adults never tire of the oceanfront views from the front of the house or relaxing on our 3 oceanfront decks, and the children never seem to get tired of their time in the pool or yard. Our children have now built special memories in Nova Scotia, and so will you and your children if you stay at our home. We are located directly on the ocean, with our own private rocky beach. You can walk to a sandy beach from our house, or drive to 1 of 10 sandy beaches within 15 minute driving time. Our house is located directly on the Atlantic Ocean near Halifax, with its own private rocky beach. Beautiful rocky beach with 15-20 mile views across St. Margaret's Bay. (5) 3 patios / decks are located on the ocean side of the house. One of the oceanside decks contains dining and casual furniture, another deck is located on the opposing side of the house from the furnished deck, and the third oceanside deck is found on the stairs leading to the oceanfront beach. Two additional decks are located at the rear of the house, including a large pool deck with dining furniture. Hubbards is a beautiful small seaside village located on St. Margaret's Bay in the center of Nova Scotia's famed Lighthouse Route, about 1/2 hour from Halifax, Nova Scotia. The town has a charming harbor used by small fishing and leisure boats in the summer and is a relaxed, Nova Scotia town. Numerous scenic drives can be taken along the ocean bordering St. Margaret's Bay, including a trip to the famous Peggy's Cove preservation district. Lunenberg, a Unesco world heritage site and frequent port of call for the HMS Bluenose (a Canadian tall ship), is only 45 minutes by car from Hubbards. Other charming seaside villages within a short drive include Chester (home of the Chester sailing race weeks), Mahone Bay (a very well preserved Colonial seaside village) and Halifax itself. Whale watching, fishing, beach combing and other seaside activities define summer along the Lighthouse Route, along with scenic drives and tours to Halifax and the surrounding communities.